It seems like at any given point I have sufficient brain space for at most two mobile games. I think the energy mechanic most of them use is a lot of the reason; I feel like I'm wasting resources if I let my energy fill completely and sit there for a while. Currently one the two games I'm playing is Fallout Shelter. The other, which I've been playing for a couple of months now, is Final Fantasy: Record Keeper. From what others have told me, previous mobile Final Fantasy games have not had a good track record. 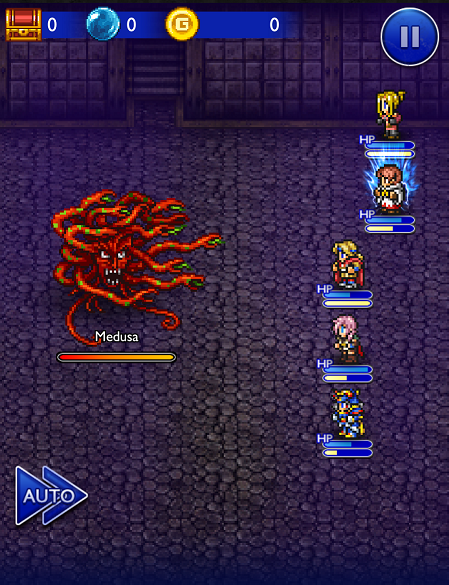 Final Fantasy: All The Bravest appears to be particularly reviled as a mindless cash grab. Happily Record Keeper is a lot more engaging and requires actual strategy to play. The real-money aspect is a bit pricey, but the special currency (mythril) comes at a decent pace in game and you can absolutely play without ever spending cash. The basic premise of Record Keeper is that there's a world that maintains records of important battles throught the multiverse in the form of magical paintings. Some evil force causes these to be damaged and so you must travel into the paintings and experience the battles they record to restore them. The battles reward equipment and orbs which are used to create all the classic FF abilites that you can then equip. Completing paintings gets you special rewards including rarer equipment and orbs, and most importantly new characters. This, to me, is the main draw of Record Keeper; the ability to build a stable of your favorite characters from across the Final Fantasy milieu and relive fights from the various games with teams built out of that stable. Boss fights typically have the same tricks and special features they had in the original games, and Dr. Mog, your mentor, can provide tips for each boss fight before you go in if you don't already know how it works. The monetization, like a lot of Japanese based games, is a gacha system. In this case what you're randomly getting is equipment from the various games, ranked from 1 to 5 stars. 5 star is the best, but also the rarest. You get one free draw a day, which could be anything (usually 1 or 2 stars, but I've gotten a couple of 4 star items that way) or you can buy draws that are guaranteed to be at least 3 star. If you pay cash for this, it works out to $3 for a single item or 11 items for $30. A bit pricey for my liking but you can get plenty of draws using in game currency. Along with the regular paintings, there are also events running on a regular basis. These are usually themed on a particular character or characters and let you unlock new characters who aren't available through the normal paintings. 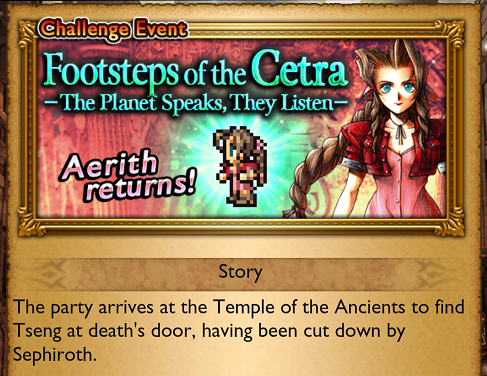 Right now the Lightning event is just about to end, and an Aerith event started a couple days ago and runs for the next week or so. If you miss a character, it'll eventually come back around again, but the character unlock is usually fairly early in the set of event fights with rare equipment and orbs as rewards for the really difficult ones. All in all, Final Fantasy: Record Keeper is a really fun game that will hit anyone with a love of Final Fantasy right in the nostalgia. If you decided to give it a try, using this link to get the game will get both you and me a little added mythril so you can start drawing new equipment that much sooner. Check it out!